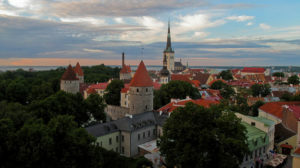 Tallinn, the capital of Estonia, one of the three Baltic States, and formerly a Soviet republic until the dissolution of the USSR in 1991, when it regained its independence and became a democratic republic, has just half a million inhabitants, while overall across its fifteen counties there are 1.3 million. 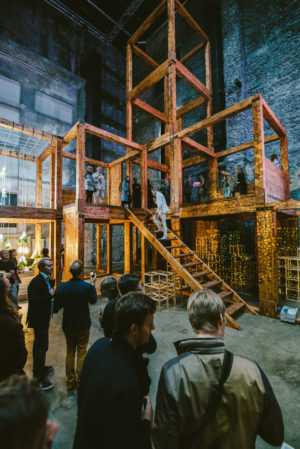 The 2015 Tallinn Architecture Biennale, part forum, part festival, was staged in autumn 2015 with the ambition to percolate further debate about how, in this small country and beyond, space, technology and community can most creatively and effectively interrelate in the context of the third industrial revolution, defined by The Economist and others as the digitisation of manufacturing, but with many other related implications. Widely seen as a technological innovator, Estonia gave birth to Skype. It has also been the first country in the world to offer all world citizens e-Residency. 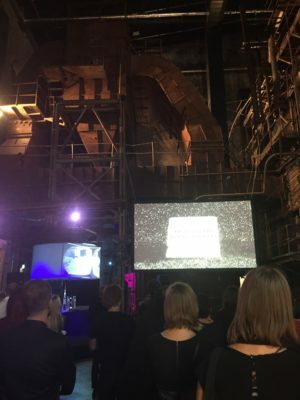 This transnational digital identity for anyone wanting to run a location-independent business online is showcased at a gallery explaining the mechanisms of digitalising a society located at Tallinn’s leafy 36 hectare Technopolis Ülemiste – Smart City. On the site of the former Dvigatel factory near the city’s airport from where more than 200 companies operate, this self-styled ‘Silicon Valley of Northern Europe’ is said to be the largest knowledge industry-based business park in the Baltics, with buildings named after famous Estonian inventors, economists, scientists, surgeons and other groundbreakers, and an ambitious 10 year growth plan. 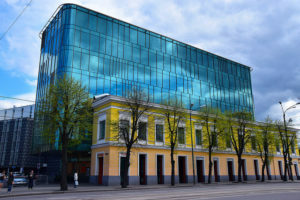 Offering rents at one third of London commercial office prices currently, Ülemiste’s CEO Margus Nõlvak is keen to bring innovative IT and high tech companies from the UK to Estonia. Few testing grounds for new technologies combine relatively untouched nature and a rich Hanseatic heritage as Estonia does, but, rather than be tied to such a national driver, the 2013 Tallinn Architecture Biennale chose a rather different focus in the capital – how to ‘recycle socialism’ – engaging with the value and future of its Soviet-era architectural heritage. Redundant buildings, overtaken by societal changes, became venues for exhibitions and workshops. The Amsterdam-based Failed Architects (FA) used the KEK administrative headquarters for collective farms in a town with an ageing population just to the north of Tallinn. Reflecting on its multidisciplinary scrutiny of its history from active centre to hibernating icon, the group emphasised its latent potential, not just for local use but of regional and national value. But to get it going, people needed to be pro-active about a plan that would build on today’s social realities. So after this tsunami of this upcycling idealism it was no surprise that the theme of the latest Tallinn Architecture Biennale (TAB, 9 Sept-18 Oct 2015), organized by the Estonian Centre of Architecture – the Self-Driven City – declared itself largely about responding to change, tackling big issues of identity, autonomy, boundaries and privacy, as well as the relative freedoms afforded through digital technologies. But are these themes best amplified through meetings, rather than exhibitions? Or must there be both?The discussions rippled across the opening days’ symposium of the TAB, which continues in its aim to foster local architectural culture, visualizing ideas and conceptualizing design and planning processes, unwrapping the interrelated multi-scalar current and future capacities and tasks of digital design. 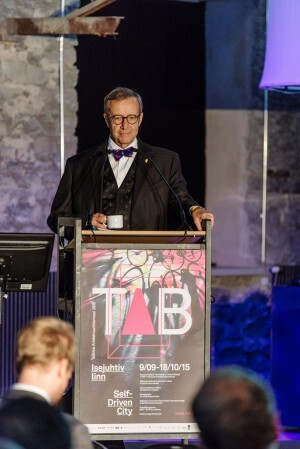 When Estonia’s technology advocate and keen bow-tie wearer President Toomas Hendrik took to the lectern at the symposium for TAB, he confined his message to saying simply that the Internet of Things was a good thing, but apps and interfaces must be designed to preserve data integrity. The energetic architect and urban planner Marten Kaevats, in charge of the TAB this time, an active promoter of number of NGOs including the open source web platform Community Tools, and ‘councillor of digital technologies’ for the Estonian government’s Talent Management Programme, was a pivotal figure in debates and activities fostered. He steered TAB this year to ask how best this new industrial revolution be fully implemented? 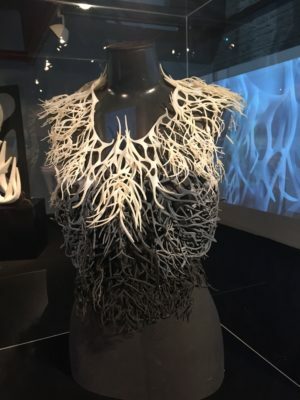 With self-driving cars emerging through government support, and 3d printing and robotics by now today’s academic stock-in-trade, and increasing industrial exemplars employing self assembly and smart materials becoming the societal norm, what kind of peripheral vision and extra triggers are needed, that TAB could enable? The show and tell formula of this particular Biennale turned out to be very good in parts, like the curate’s egg. I, for one, would have liked to see a final film of the key speaker statements over the numerous meeting days, one way that they avoid getting lost in the ether. Conjuring a 15 year timeframe for Estonia to become a model country of converged communities and technologies, Kaevats clearly has much invested culturally in what drives changes in cities like Tallinn. The need for new tools and ways of programming spaces to understand and navigate cities differently resonated throughout the proceedings. While Damiano Cerrone, curator of the TAB-Lab exhibition, asked rhetorically: ‘who are the city managers?’ when ‘Google wants to index the world’?, Lev Manovich, the acclaimed new media theorist and founder of Software Studies Initiative, wanted to know whether people could use big data to create a unique (self-directed) science questioning existing social and cultural categories. The Instagram images and tags of his Exceptional and the Everyday: 144 hours in KYIV exhibit, on show in the TAB-Lab, conveyed how, during the Ukrainian Revolution over a few days in February 2014 in Kyiv, the extraordinary and the ordinary coexisted, based on the SSI team’s intensive computational analysis, supported by non-visual data and their geo-coordinates. The Exceptional and the Everyday made a profound point, one also easy to digest by social media aficionados. It was one of the better works on show at the TAB-Lab’s R&D focused exhibition at the co-opted Kultuurikatel cultural centre (an NGO), an atmospheric industrial building in Tallinn’s harbour area otherwise known as the set of Tarkovsky’s film Stalker (it also hosts an annual Stalker Festival for art and music). Exploring through other, contrasting, but equally significant projects, what the third industrial revolution means for architecture and the built environment, and for society, it made inroads, but needed to spell out its messages more clearly. It is rare to find a group of planners, SPIN Unit (Spatial Intelligence Unit), the TAB-Lab’s curators, committed to hacking the invisible city, and vital as big data has far more potential than being used to provide a civic service, or as marketing or surveillance instrument. 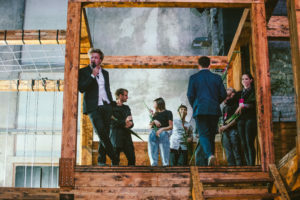 Co-founded by Cerrone and Kristjan Männigo, with an artist, philosopher and a physicist, based in Tallinn, SPIN has a network of ten members across Europe, similar to Failed Architecture. 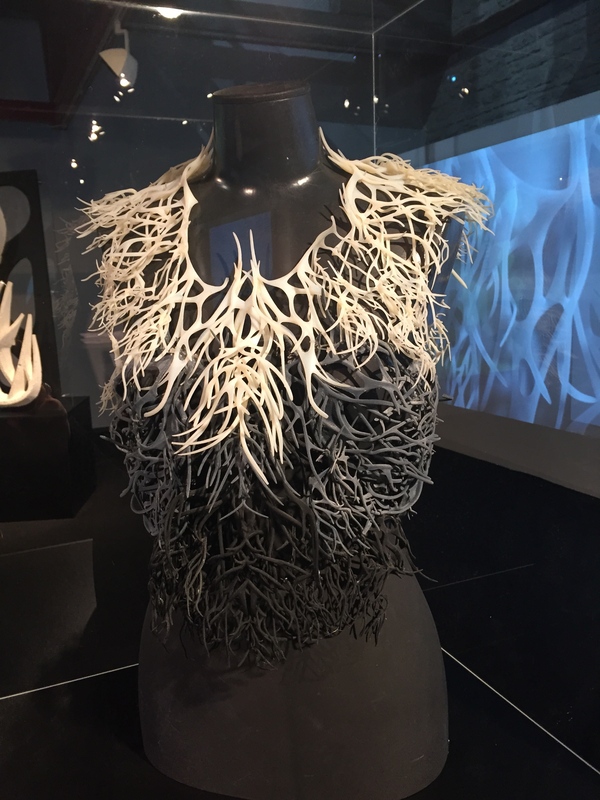 As SPIN’s TAB-Lab exhibition aimed to demonstrate, shifts in digital design’s evolution and operating potential signify hefty challenges and opportunities for architects, designers and urban planners as professionals – and people generally. Whether deployed in areas hit by flooding and at risk of tsunami, such as South East Asia, as in the case of Casagrande Laboratory’s self-organised, burn-proof laminated wood Paracity structure, or World Without Architects’ installation which allowed you to virtually build a simple house, site it in a neighbourhood, customise it and finally print it out on a 3d printer, design is a process theoretically anyone can engage in organically, through urban acupuncture, and by going full cycle if they so wish. Engaging visitors in processes was the right way to go for TAB-Lab to be accessible, even though things like the increasing use of self-replication in artificial systems is harder to show beyond the screen. 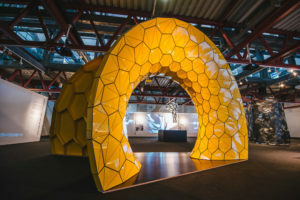 We could experience Protoinvent and StudioPalermo’s live 3d printing of ceramic tiles which organically change their shape and transmit light, taking place throughout the day. 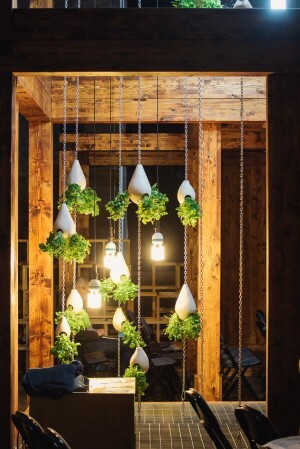 Other second nature ideas included the Reverse Garden from students at the Department of Architecture at the Estonia Academy of Arts, prototyping upside down hydroponics, whose advantage is automated watering and reduced, soil-free bulk. The vivid congregation of ten architectural projects in the Body Building exhibition at the Estonian Museum of Architecture presented individualized ways of transcending the time-honoured Platonic opposition of building to body. Posing questions about how we read the resulting elements, their makers’ capacity to self-organise and control that is central to these hybrid forms of construction involves technology, science and material systems in negotiating an equilibrium between the two. Body Building gave visitors a good mix of types of composite construction, additive manufacturing and deployments of algorithmic data, biological organisms and performative systems few may have seen the light of day before in the Museum, which has a whole ground floor dedicated to models and visuals of Estonia’s built architectural highlights including work by a number of outstanding younger architects, such as the prolific Veronika Valk, board member of the Kultuurikel. 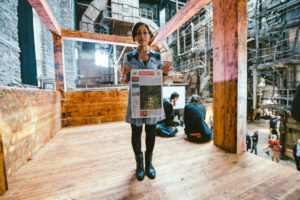 From Bruno Juricic’s reinvention of the primitive hut in a denaturalized context, Kokkugia’s ornamentation based on swarm intelligence and Tom Wiscombe’s geometric, composite joinery, to Carlo Ratti’s Responsive Flotation system simulating bodily experiences, planned for the 2018 World Water Forum in Brasilia, and Julia Körner’s Kelp Jacket mimicking living matter, Body Building engagingly encapsulated the increased blurring between environments that are built and those which are grown, and the unbound nature of the field of BioGeoFab (biology, geometry and fabrication) feeding architecture’s self-driven intelligence systems. A parallel vision of unboundness permeated the winning entry in TAB 2015’s urban design Vision competition involving a real test site. For this, Kaevats and his colleagues chose the epicenter of traffic in the city – the huge Viru Intersection. Sitting between the organic historic fabric of the old town with its defensive walls, and the 19th century Rotermanni industrial quarter, Viru is populated by a mix of large buildings from the Soviet period and more recent constructions. The self-driven city, according to judges Winy Maas (MVRDV partner), Endrik Mänd, Chief Architect of Tallinn and Villem Tomiste, principal of architectural practice Stuudio Tallinn, is not only one without traffic lights, but where cars on demand can appear at any time, meaning fewer cars and parking spaces. 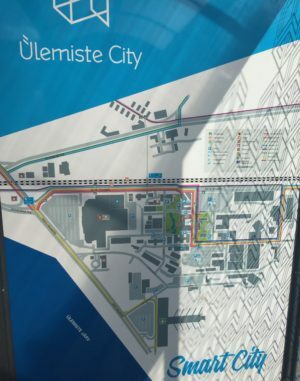 Many attempts have been made throughout recent history to design a square here: under the first period of Estonian independence, in the Soviet years and today, in the context of regained independence. 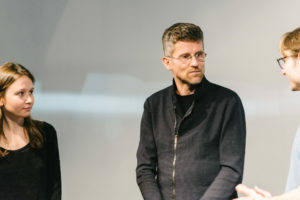 To help trigger the Viru Intersection’s rebirth, won by Enhanced Urban Movement, a design from the Danish team of Clement Lobbens and Frederique Barchellard, who beat an Estonian team of architects – Anni Müüripeal, Sander Paling and Märten Peterson – into second place. Instead of trying to foist a simplistic traffic calming plan onto the space the winning team put forward a strong, clear design reminiscent of Superstudio’s work of no boundaries, freeing up space for nature and amenities. 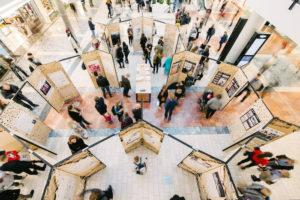 Enhanced Urban Movement, along with the other 22 international entries received, was put on public show in the Viru shopping centre. As a design proposal, it deftly interrelated all forms of mobility while articulating an appealing public character, and the jury found it the most flexible, and credibly programmed design they viewed, responding in full to the multi-scalar needs of the space, from the range of zones to key details of bicycle holders. From its cohesive dignity, an interesting future square emerges. As Tallinn’s history demonstrates, changes in political structures and policy changes so often leave architecture’s built forms behind, but a self-directed, open source city must not only bring everyone with it, but let them set more of the terms than in the past. Will the competition for Viru put self-direction on the map by being built? Probably not, it seems. 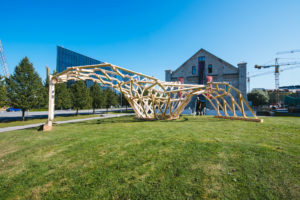 From the clearly visible to the more abstractly conceived, TAB’s exhibits were graspable by the public with some varying degrees of ease, as part of a fine kaleidoscope of possibilities for systemic changes to Tallinn, and cities more widely. While the legacy of TAB 2015 seems clear to read, by those with the motivation to focus, some more accessible tools to remind everyone of the key points would accentuate the Biennale’s mission before the next extravaganza, taking a different theme, kicks in.